The recommendation follows an investigation of a 2010 Missouri accident – involving a pickup truck, semi and two school buses – said to have been caused by a distracted driver, who was only 19 years old. That accident injured dozens of people and claimed the life of both the young driver and a 15-year-old girl. There’s no question that we as Americans want to preserve lives on our nation’s highways. In 2010, more than 3,000 people lost their lives due to distraction, according to NHTSA data. That’s nine percent of all traffic-related fatalities. As the proliferation of technology grows – there are now more mobile phones in the U.S. than Americans – it’s only natural that people are going to want to stay connected while in the car. But we can’t take accidents and deaths, caused by drivers not paying attention, lightly. I recently shed light on a member of the automotive community who was carelessly using an iPad and iPhone while driving down a major highway in Virginia. While he’s certainly not the only person to have used a portable electronic device behind the wheel, I believe strongly that we can all do a better job of focusing on the drive by putting our devices aside. Learn more about my distracted driving campaign here. Earlier this year, I had a conversation with NHTSA Administrator David Strickland on distracted driving and the agency’s plan to make official recommendations to auto manufacturers regarding it. I also spoke with Airbiquity’s Leo McCloskey in August, a telematics company that services car makers directly, and he indicated the company would meet with NHTSA to see how they could work together. Given that the NTSB has come out so strongly, and publicly, with a suggestion to ban all device usage for drivers makes me wonder how this will play out for OEMs, dealers and consumers. As someone who has covered the distracted driving issue extensively through this blog and who’s committed to driving safely, I think that the NTSB’s statement has already made a big impact. 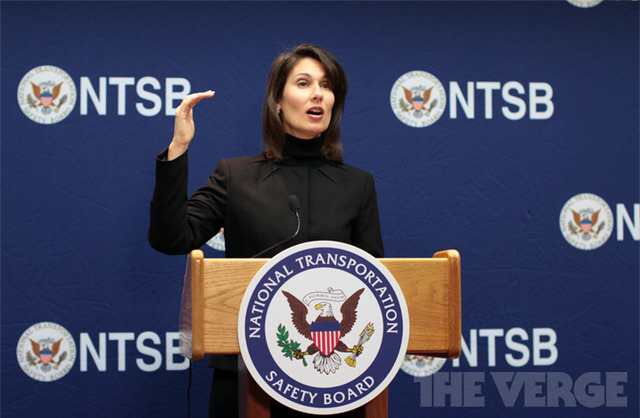 The conversation on the “NTSB cell phone ban” is happening everywhere – both on- and offline. Perhaps that means the general public will think twice before using handheld devices while driving. Only phones that are installed as part of the vehicle’s system would be exempt from the type of ban the NTSB recommended. In-car GPS and OnStar systems are also still OK. Currently, 35 states ban texting while driving and 10 ban all cell phone usage. While the NTSB made a suggestion for the entire nation, ultimately it will be left up to the states to decide how to legislate. When chatting with Mr. Strickland in June, he indicated that NHTSA cannot regulate what people do in their cars, but the agency can recommend what automakers should and shouldn’t include in their vehicles. Could it be that when NHTSA comes out with its guidelines for car manufacturers, the agency will seriously suggest that they implement hands-free, voice command technology in all makes and models down the road? Who knows, perhaps even Airbiquity – the company that can provide the technical support for such a rule – could be part of NHTSA’s overall guidelines. Only time will tell what the laws will become and how people will react to them. But for now, I hope that my story about an automotive tweeter behind the wheel and the tragic accident spotlighted by NTSB will make the average Joe’s and Jane’s out there think twice about checking their email or texts while driving. I know that these situations have certainly reignited in me a dedication to be distraction free. Thank you for keeping this topic in the forefront of the national discussion, Melanie. Distracted driving has long been my pet peeve, but it wasn’t until I found you covering this topic extensively was I able to lend my voice to this matter. I believe that it will take many years for the states to enact legislation. Well before that, I hope that drivers understand the risks posed by not keeping both hands on the wheels and engaging in non-driving related activities. I also want to thank you, Melanie, for keeping this issue at the front of our minds. I would LOVE it if there was a federal law to ban cellphone use by drivers in vehicles, but I don’t say that because I’m ticked off at other people doing it. I’m routinely giving in to my own urge to type messages while at stoplights in the city. It’s just too easy to do. A while back, I put a moratorium on my personal cellphone use while driving. I think that I lasted about a week before I began making exceptions to my rules. I recognize it’s unsafe–even when texting at a stoplight, there’s a temptation to continue a message when the light turns green or start typing when approaching a red light. From there it’s a just a short step to texting while on the highway. I wish that car manufactures would install technology in cars that disable the text AND talk (even hands free) capabilities while keeping the navigation capabilities of the phone active. But then I think, “shoot! that means the passengers won’t be able to talk either.” That’s unreasonable I think. Hmmmmm…tough problem. Well, I don’t think we can develop a culture of safe driving habits without the laws in place to promote that culture. Like seat belts–I would never neglect putting on my seat belt, but it’s a behavior I have been practicing since a child. I know from traveling in other countries that some places outside of the US don’t have the seat belt laws we have and people die every day because of it. I can’t wait for the day when it’s common practice to disable talk & text features while driving.